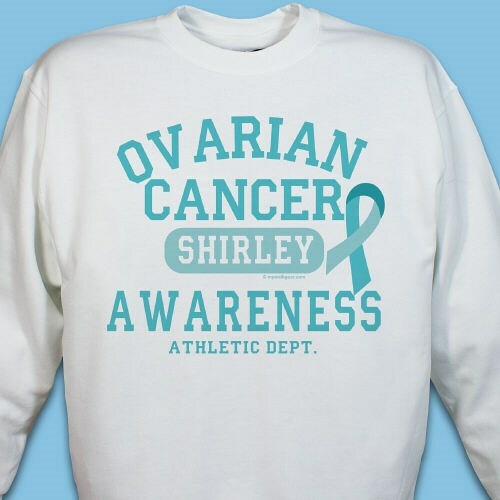 This Ovarian Cancer Awareness Sweatshirt is the perfect way to promote and advocate Ovarian Cancer Awareness while joining Awareness events or walks. Show your support for Ovarian Cancer Awareness today with our eye-catching awareness sweatshirt. Your Cancer Awareness Sweatshirt is available on our premium white, pink & ash grey cotton/poly blend sweatshirts, machine washable in youth sizes XS-L and adult sizes S-3XL. Free Personalization of any name is included. Additional Info Gather your support team and start spreading Ovarian Cancer Awareness with eye-catching Ovarian Cancer Awareness Apparel & Walk Gear, from MyWalkGear.com. Our line of awareness apparel is great for any upcoming awareness walk or event. Be sure to show your support with our Ovarian Cancer Awareness Key Chain & Ovarian Cancer Awareness Long Sleeve Shirt as well.